Ostrich farmers in the Little Karoo have lost an estimated R1bn and have had to lay off 15% to 20% of their workforce as the crippling drought enters its fourth year. The size of the flock declined by 20% last season, and lucerne fields in the region stand bare. Joey Potgieter, chair of Agri Klein Karoo, said the irrigation supply dams of Stompdrift and Kammanassie were effectively empty and there was no flow in the rivers. "All my tractors are standing in the garage. They've been standing there for three years. Since 2015 I haven't used them because my long-term crops like lucerne, which we've been growing for 25 years, are non-existent now. Everything is dead. You can't irrigate the lands because the dams have no water," Potgieter said. The size of the ostrich flock declined from 160 000 in 2017 to 115 000 at the end of the season in June 2018. And ostrich farmers are not eligible for government drought relief as ostriches are classified as "game" not livestock. "Every morning when you get up you must first talk yourself into going out there, to make sure you don't do something you mustn't do. It's depressing because it's been so long. One year of drought, okay, or even two. But we've had three years already." Potgieter said farmers had tried to keep workers on their farms for as long as they could, by reducing the number of hours they were employed. "But some farmers just couldn't anymore and they've had to let them go. Between 15 and 20% are gone already." Added to the drought was the blow in March last year when the EU, South Africa's largest importer of ostrich meat, banned ostrich meat imports from here after an EU audit found that the national government testing laboratories were not up to standard. 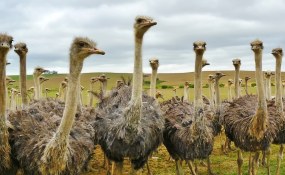 Piet Kleyn, chair of the Ostrich Business Chamber in Oudtshoorn, said the EU required that regular blood samples be taken from ostriches on farms and at abattoirs as part of a standard monitoring programme to ensure the birds were free from chemicals such as growth hormones. Kleyn said the local industry did not use growth hormones or other chemicals banned by the EU. "It was not an industry problem, it was the national laboratory in South Africa that failed the audit. It was an extensive audit that looked at the paper trail of sampling and the laboratory specifically to see if all the correct processes were followed, and they were not happy. So they delisted South Africa as an exporter to the EU. It was a terrible knock for the industry." Since then the ostrich industry, working with the Department of Agriculture, Forestry and Fisheries, has sent ostrich blood samples for chemical testing to a laboratory in the UK and all have been negative. "So we have a good opportunity to get back on that EU list, but there is a lot of bureaucracy so it is not easy to turn the ban around," Kleyn said. He said it was fortunate that the international price for ostrich feathers was good, and was "improving" for leather. Lucerne and other feed crops like alfalfa, which most Little Karoo ostrich farmers normally grew on their lands to feed their flocks, now has to be imported from as far as the Free State and Northern Cape, adding the cost of transport into production costs. Farmers had reduced their flocks by raising fewer chicks as the drought continued its grip, but fewer birds pushed the unit cost up. Carl Opperman, CEO of Agri Western Cape, said the Gouritz River catchment area, which included the Little Karoo, was in a state of crisis. The Gamkapoort and the Gamka dams were totally empty. Sheep farmers were battling to supply fodder. "And in the Great Karoo there are places that are entering their fourth or fifth year of drought. It is devastating. In some places there is nothing growing. Nothing, just sand," Opperman said. The Karoo extended from the Western Cape into the Eastern and Northern Cape and North West. "In some parts of the Karoo it is a fight for life and death". While the Little Karoo irrigation dams are very low or empty, Oudtshoorn Municipality spokesperson Ntobeko Mangqwengqwe said the town's Raubenheimer supply dams, which had dropped to 31% last year, summer rains had filled it to 54% by the end of December. The municipality's water restrictions and increased tariffs had resulted in a cut in residential consumption from 17 million litres a day in August to nine million litres today. Herman Pieters, spokesperson for Garden Route District Municipality, said Calitzdorp's main supply dam had sunk to 11% of storage capacity, leaving the town with about five months of water. Pieters said in Zoar the Tierkloof supply dam had run dry after Christmas. An alternative water source, the Jongmansland dam, was 12% full. "At the current rate of abstraction, water in storage would last only for the next month," he said. The Department of Agriculture, Forestry and Fisheries was asked to comment but had not replied at the time of publication.